Today we’re going to talk about various types of Gooseneck Hitches. A Gooseneck Hitch is similar to a 5th Wheel hitch in that it’s designed for hauling big loads and for use in a pickup truck. The main difference is that a Gooseneck Hitch uses a ball and coupler instead of a kingpin and pin box receiver (see our earlier blog about 5th Wheel Hitches). The most common use of this hitch style is for hauling a horse trailer. 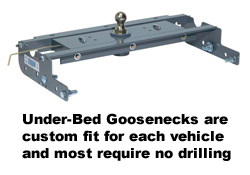 Gooseneck Hitches are available as under-bed, fold-down or above bed models. These models allow you to quickly and easily remove the ball from the truck bed when it’s not being used. This frees up space in the truck bed for other uses. The Above-Bed Gooseneck Hitches: This hitch system uses the same type of rails as the 5th wheel hitch which makes it easy to remove and install. If you find that you need to use both a fifth wheel and a gooseneck hitch to meet various needs, this hitch is an easy-to-use solution. 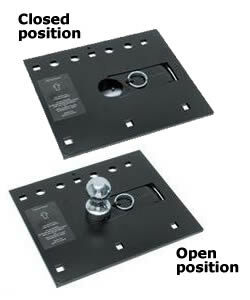 The Under-Bed Gooseneck Hitches: This is the most popular version gooseneck hitch sold today. The rails attach under the bed of your pickup to support the gooseneck head and are custom fit to your specific vehicle. The ball can be lowered or removed when you not using it on some brands. It’s a good idea to stay with the brand names on this big boy - big names you trust like B&W, Draw-Tite, and Blue Ox. All of these under-bed gooseneck hitches only need a 4” hole in the truck bed and most need no drilling of the vehicle frame to install them. The Fold Down Gooseneck Hitch: Like the under-bed model, the fold down gooseneck hitch uses rails under the pickup bed but is different in that the hitch ball is mounted on a plate in the bed. 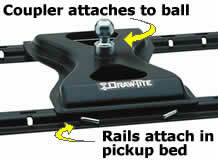 This hitch style requires a larger hole for installation in the pickup bed than the under-bed style. The upside is that the ball folds down so you can use all of the pickup bed. You can pick up custom fit installation rails for most applications. Those are sold separately. You can view all of the best brands and styles of Gooseneck Hitches here. Use our vehicle search chart to determine the best option for your specific vehicle. If you have any questions about the Gooseneck Hitch you can always give us a call. We have professionals on hand who can answer virtually any question about the product or installation. Give us a call at 877-509-0719. In our next article we’ll talk about the accessories you will need and terms you’ll need to know to give you the information you’ll need to know before installing your gooseneck hitch.